Type VII U-boats were the most common type of German World War II U-boat. U-boat stands for Unterseeboot, which means "submarine" in German. 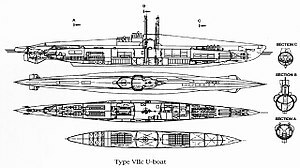 The Type VII was based on earlier German submarine designs going back to the World War I Type UB III and especially the cancelled Type UG. The type UG was designed through the Dutch dummy company Ingenieurskantoor voor Scheepsbouw Den Haag (I.v.S) to circumvent the limitations of the Treaty of Versailles, and was built by shipyards around the world. The Finnish Vetehinen class and Spanish Type E-1 also provided some of the basis for the Type VII design. These designs led to the Type VII along with Type I, the latter being built in AG Weser shipyard in Bremen, Germany. The production of Type I was cut down after only two boats; the reasons for this are not certain. The design of the Type I was further used in the development of the Type VII and Type IX. Type VII submarines were the most widely used U-boats of the war and were the most produced submarine class in history, with 703 built. The type had several modifications. The Type VII was the most numerous U-boat type to be involved in the Battle of the Atlantic. Type VIIA U-boats were designed in 1933–34 as the first series of a new generation of attack U-boats. Most Type VIIA U-boats were constructed at Deschimag AG Weser in Bremen with the exception of U-33 through U-36, which were built at Friedrich Krupp Germaniawerft, Kiel. Despite the highly cramped living quarters, type VIIA U-boats were generally popular with their crews because of their fast crash dive speed, which was thought to give them more protection from enemy attacks than bigger, more sluggish types. Also, the smaller boat's lower endurance meant patrols were shorter. They were much more powerful than the smaller Type II U-boats they replaced, with four bow and one external stern torpedo tubes. Usually carrying 11 torpedoes on board, they were very agile on the surface and mounted the 8.8 centimetres (3.5 in) quick-firing deck gun with about 220 rounds. Ten Type VIIA boats were built between 1935 and 1937. All but two Type VIIA U-boats were sunk during World War II (famous Otto Schuhart U-29 and U-30 which was the first submarine to sink a ship in World War II, both scuttled in Kupfermühlen Bay on 4 May 1945). The boat was powered on the surface by two MAN AG, 6 cylinder 4-stroke M6V 40/46 diesel engines giving a total of 2,100 to 2,310 brake horsepower (1,570 to 1,720 kW) at 470 to 485 rpm. When submerged it was propelled by two Brown, Boveri & Cie (BBC) GG UB 720/8 double-acting electric motors giving a total of 750 horsepower (560 kW) at 322 rpm. The VIIA had limited fuel capacity, so 24 Type VIIB boats were built between 1936 and 1940 with an additional 33 tonnes of fuel in external saddle tanks which added another 2,500 nautical miles (4,600 km; 2,900 mi) of range at 10 knots (19 km/h; 12 mph) surfaced. More powerful engines made them slightly faster than the VIIA. They had two rudders for greater agility. The torpedo armament was improved by moving the aft tube to the inside of the boat. Now an additional aft torpedo could be carried below the deck plating of the aft torpedo room (which also served as the electric motor room) and two watertight compartments under the upper deck could hold two additional torpedoes giving it a total of 14 torpedoes. The only exception was U-83, which lacked a stern tube and carried only 12 torpedoes. On the surface the boat was powered by two supercharged MAN, 6 cylinder 4-stroke M6V 40/46 diesels (except for U-45 to U-50, U-83, U-85, U-87, U-99, U-100, and U-102 which were powered by two supercharged Germaniawerft 6-cylinder 4-stroke F46 diesels) giving a total of 2,800–3,200 metric horsepower (2,100–2,400 kW) at 470 to 490 rpm. When submerged, the boat was powered by two AEG GU 460/8-276 (except in U-45, U-46, U-49, U-51, U-52, U-54, U-73 to U-76, U-99 and U-100 which retained the BBC motor of the VIIA) electric motors giving a total of 750 metric horsepower (550 kW) at 295 rpm. 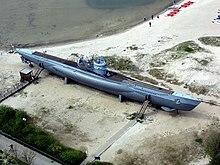 The Type VIIC was the workhorse of the German U-boat force, with 568 commissioned from 1940 to 1945. The first VIIC boat commissioned was the U-69 in 1940. The Type VIIC was an effective fighting machine and was seen almost everywhere U-boats operated, although its range of only 8,500 nautical miles was not as great as that of the larger Type IX (11,000 nautical miles), severely limiting the time it could spend in the far reaches of the western and southern Atlantic without refueling from a tender or U-boat tanker. The VIIC came into service toward the end of the "First Happy Time"[Note 6] near the beginning of the war and was still the most numerous type in service when Allied anti-submarine efforts finally defeated the U-boat campaign in late 1943 and 1944. On the surface the boats (except for U-88, U-90 and U-132 to U-136 which used MAN M6V40/46s) were propelled by two supercharged Germaniawerft, 6 cylinder, 4-stroke M6V 40/46 diesels totaling 2,800 to 3,200 PS (2,100 to 2,400 kW; 2,800 to 3,200 shp) at 470 to 490 rpm. For submerged propulsion, several different electric motors were used. Early models used the VIIB configuration of two AEG GU 460/8-276 electric motors, totaling 750 PS (550 kW; 740 shp) with a max rpm of 296, while newer boats used two BBC GG UB 720/8, Garbe, Lahmeyer & Co. RP 137/c or Siemens-Schuckert-Werke (SSW) GU 343/38-8 electric motors with the same power output as the AEG motors. Four VIIC boats were modified for use as surface escorts for U-boats departing and returning to French Atlantic bases. These "U-flak" boats were U-441, U-256, U-621, and U-953. Conversion began on three others (U-211, U-263, and U-271) but none was completed and they were eventually returned to duty as standard VIIC attack boats. Type VIIC/41 was a slightly modified version of the VIIC and had the same armament and engines. The difference was a stronger pressure hull giving them a deeper crush depth and lighter machinery to compensate for the added steel in the hull, making them slightly lighter than the VIIC. A total of 91 were built. All of them from U-1271 onwards lacked the fittings to handle mines. 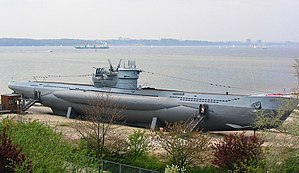 Today one Type VIIC/41 still exists: U-995 is on display at Laboe (north of Kiel), the only surviving Type VII in the world. The Type VIIC/42 was designed in 1942 and 1943 to replace the aging Type VIIC. It would have had a much stronger pressure hull, with skin thickness up to 28 mm, and would have dived twice as deep as the previous VIICs. These boats would have been very similar in external appearance to the VIIC/41 but with two periscopes in the tower and would have carried two more torpedoes. Contracts were signed for 164 boats and a few boats were laid down, but all were cancelled on 30 September 1943 in favor of the new Type XXI, and none was advanced enough in construction to be launched. It was powered by the same engines as the VIIC. The type VIID boats, designed in 1939 and 1940, were a lengthened – by 10 m (32 ft 10 in) – version of the VIIC for use as a minelayer. The mines were carried in, and released from, three banks of five vertical tubes just aft of the conning tower. The extended hull also improved fuel and food storage. On the surface the boat used two supercharged Germaniawerft, 6 cylinder, 4-stroke F46 diesels delivering 3,200 bhp (2,400 kW) at between 470 and 490 rpm. When submerged the boat used two AEG GU 460/8-276 electric motors giving a total of 750 shp (560 kW) at 285 rpm. Only one (U-218) managed to survive the war; the other five were sunk, killing all crew members. ^ 2 MAN, 6 cylinder 4-stroke M6V 40/46 diesels totalling 2,100 – 2,310bhp. Max rpm: 470–485. ^ 2 supercharged MAN, 6 cylinder, 4-stroke M6V 40/46 diesels totalling 2,800 – 3,200bhp. Max rpm: 470–490. ^ 2 supercharged Germaniawerft, 6 cylinder, 4-stroke M6V 40/46 diesels totalling 2,800 – 3,200bhp. Max rpm: 470–490. ^ 2 supercharged Germaniawerft, 6 cylinder, 4-stroke F46 diesels totalling 2,800 – 3,200bhp. Max rpm: 470–490. ^ 2 Brown, Boveri & Cie GG UB 720/8 double-acting electric motors, totalling 750shp. Max rpm: 322. ^ 2 AEG GU 460/8-276 electric motors, totalling 750shp. Max rpm: 295. ^ Same as VIIA or VIIB, 2 Siemens-Schuckert-Werke GU 343/38-8 electric motors, totalling 750shp and max rpm: 296 or 2 Garbe Lahmeyer RP 137/c electric motors, totalling 750shp and max rpm: 296. ^ a b c d e f g h i j k l m n o p Helgason, Guðmundur. "Type VIIC". U-Boat War in World War II. Uboat.net. Retrieved 10 February 2010. ^ Gröner, Erich (1990). German Warships 1815–1945. Annapolis: Naval Institute Press. p. 77. ISBN 0-87021-790-9. ^ Poirier, Michel Thomas, Commander, USN (20 October 1999). "Results of the German and American Submarine Campaigns of World War II". Archived from the original on 9 April 2008. The cost of a Type VII is estimated at US$2.25 million (equivalent to $30 million in 2018). ^ Möller, Eberhard; Brack, Werner (2004). The Encyclopedia of U-Boats. London: Chatham. pp. 69–73. ISBN 1-85367-623-3. ^ Campbell, John (1985). Naval Weapons of World War Two. Annapolis: Naval Institute Press. p. 251. ISBN 0-87021-459-4. ^ "Type VII U-Boat". German U-Boat. Uboataces.com. Retrieved 13 February 2010. ^ a b c d Helgason, Guðmundur. "Type VIIA". U-Boat War in World War II. Uboat.net. Retrieved 10 February 2010. ^ a b c d Helgason, Guðmundur. "Type VIIB". U-Boat War in World War II. Uboat.net. Retrieved 13 February 2010. ^ a b c d e f g h Helgason, Guðmundur. "Type VIIC". U-Boat War in World War II. Uboat.net. Retrieved 13 February 2010. ^ Busch, Harald (1955). U-Boats at War. New York: Ballantine Books. ^ a b c Helgason, Guðmundur. "Type VIID". U-Boat War in World War II. Uboat.net. Retrieved 15 February 2010. ^ a b Helgason, Guðmundur. "Type VIIF". U-Boat War in World War II. Uboat.net. Retrieved 20 February 2010. ^ a b c d Gröner 1991, pp. 43–46. ^ Gröner 1991, pp. 65–66. ^ Gröner 1991, pp. 66–67. ^ Gröner 1991, p. 67. Rossler, Eberhard (1981). The U-Boat. Annapolis, Maryland (USA): Naval Institute Press. ISBN 0-87021-966-9.